Living a Fit and Full Life: JA-VIE Offers Stylish Flats with Superb Arch Support and Flexibility! JA-VIE Offers Stylish Flats with Superb Arch Support and Flexibility! JA-VIE offers stylish flats with superb arch support and flexibility. Made of patent-pending technology, these shoes combine the softest double-ply mercerized cotton knit "sock" with lightweight jelly outsoles and cushioned leather insoles. The result is a second skin fit with dynamic flexibility and maximum support for your feet. Natalie and Eric are high school sweethearts,who have been together for over 18 years. When pregnant with the couples’ first child, Natalie had a very difficult delivery and could not walk for several months due to severe pelvic bone separation. She was literally walking in pain for months. It was during this time that she and Eric saw the opportunity to make pretty, comfortable flats using socks!! "I couldn't find pretty flats that were comfortable enough to wear day in and day out" Natalie said. Being a fashion girl, she didn't want to sacrifice looks for comfort. Leveraging their expertise in R&D/supply chain, they spent two years developing a better shoe and finally perfected the prototype. They named the brand “JA-VIE” - after their 2 beautiful children Javier and Viera. You asked and we deliver! Our new Sand Stripe is the perfect neutral to wear with anything, for any season! It's Limitless! Sand Stripe flats are the perfect combination of Sand (Light Beige) feedstripe (that's a very subtle repeating stripe) Also available in Indigo Stripe. Made of patent pending technology, these flats combine the softest double-ply mercerized cotton knit "sock" with lightweight jelly out-sole and cushioned leather insoles. 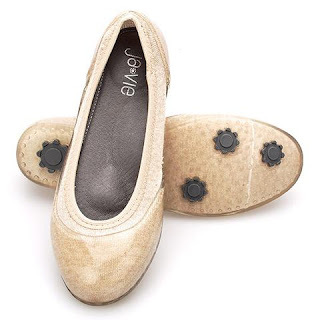 Ja-vie flats have gray insoles, with arch, ball and heel support. I'm absolutely head over heals in love with these JA-VIE Sand Stripe Flats! I'm a runner, a mom of 4 and so much more and as such I'm on my feet a lot. That's why I need a really comfortable pair of flats. Enter JA-VIE flats! JA-VIE flats feel amazing! I can literally feel the arch, ball and heel support hug and support my foot. I've been wearing these JA-VIE Sand Stripe Flats non stop, even around the house when I have no where to go just because they feel so amazing. My husband just looks at me funny when I'm walking around the house in my PJs and JA-VIE flats. I also love that these JA-VIE Sand Stripe Flats go with everything so I literally can wear them every time I step out the door. From casual to elegant they look amazing. I also really like the lightweight jelly out-sole because it keeps them looking brand new. 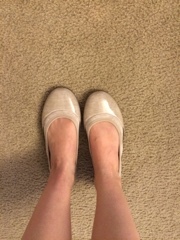 JA-VIE flats are simply amazing and I highly recommend them! Click HERE to find a store near you that sells JA-VIE! Click HERE to learn more about JA-VIE! Follow JA-VIE on social media!